People: There are four main groups – Hausa, Djerma, Fulani and Tuareg. Languages: French and Arabic are the official languages but local languages are widely spoken. Religion: Over 95% of the populations are Muslim. Membership of international organisations: United Nations (UN), African Union (AU), Organisation of Islamic Conference (OIC), Economic Community of West African States (ECOWAS), Union Economique et Monetaire Ouest Africaine (UEMOA), International Organisation of the Francophonie (OIF). Main trading partners: exports – France, Nigeria, United States; imports – France, Cote d'Ivoire, China, Nigeria. Niger's most important export is uranium, accounting for some 30% of the country's exports by value. Since 2004 prices have soared. In 2006 Niger licensed three Chinese companies to prospect for further uranium. A small gold mine has opened and exports began in 2005, although its contribution to the economy is likely to be modest. The Malaysian state oil company, Petronas, struck oil in January 2005 on its Agadem concession but it is not yet clear if reserves will be sufficient to justify commercial production. Apart from the mining sector, Niger is essentially an agricultural and pastoral economy. Cyclical drought (worst in 1969, 1973/4, 1985 and 2004/5) and locust infestation (as in 2004), can have devastating effects on food production, animal husbandry and cash crops. The recent harvests have been good however. A main cash crop, cotton, suffers erratic production levels partly due to recurring drought and partly to depressed world prices. Niger, along with other countries in the Sahel, suffers persistent food insecurity. Niger's strategic cereal reserves had been wiped out by the prolonged drought in 2004/5. 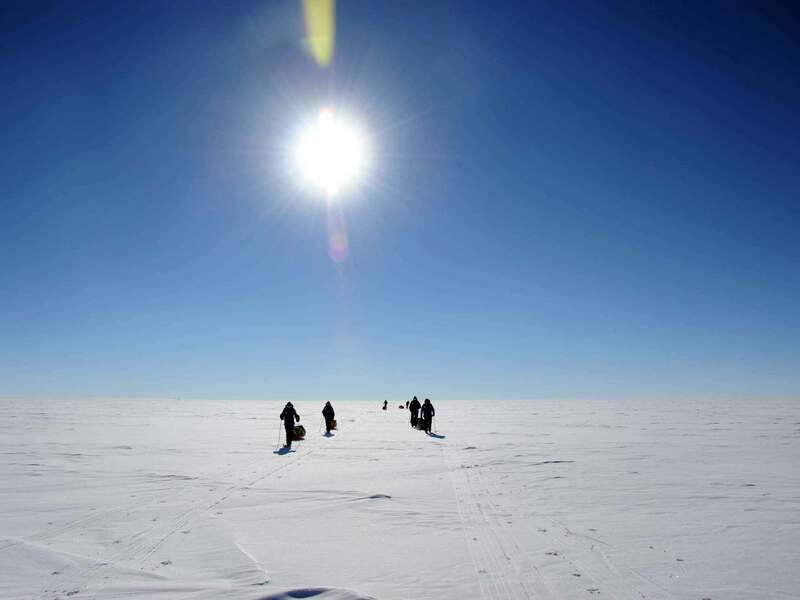 This had caused a major crisis by the middle of 2005, although the situation has now improved due to the international response and due to the improved harvest in the latter half of 2005. President Tandja's government has embarked on an economic reform programme, supported by the IMF with whom he signed second a 3-year programme in February 2005, for some US$10 million, to support the country’s poverty reduction and growth strategy. Niger was a French colony, part of French West Africa. 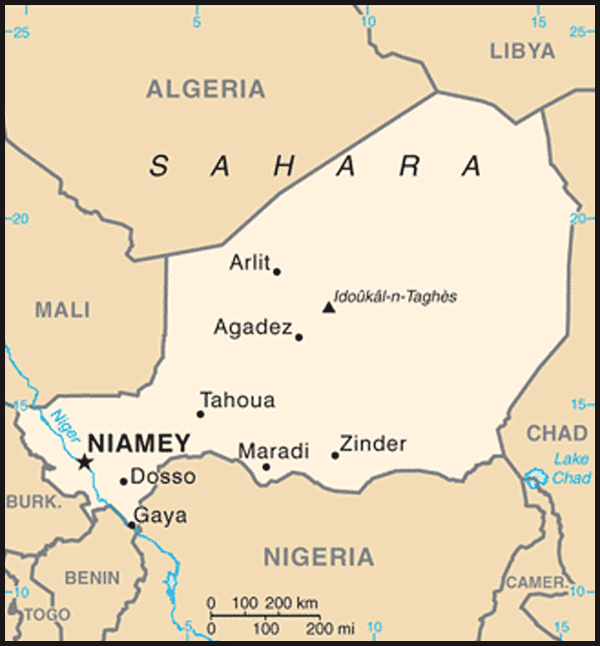 Niger was granted its independence in 1960 but retained strong ties with France through a series of bilateral agreements, including a defence agreement, and its membership of the Franc Zone. Its first President, Hamani Diori, introduced a one-party state which survived until Niger experienced its first military coup in 1974. The military regime, first under Colonel Seyni Kountche till his death, followed by Colonel Ali Sabou, stayed in power until 1991. Following trends elsewhere in Africa, domestic and international pressure forced the military to concede to demands for a multi-party democracy. In 1991 a National Conference drew up a new constitution, a transitional civilian government was formed, elections were held and a new civilian government was installed in April 1993. But it was not to last. Three years later, the military, led by Colonel Bare Mainassara, intervened again in January 1996. His regime survived until April 1999 when it was overthrown by a fellow military officer, Major Wanke. Although Mainassare had civilianised his regime and held elections, in which he won the Presidency, his government was oppressive and corrupt. Wanke's takeover was therefore widely welcomed in Niger, although it was condemned by the EU , the USA and the OAU. He promised a return to civilian rule within nine months. He kept his word. Landlocked and surrounded by seven states, Niger maintains good relations with its neighbours. President Tandja was in 2005 concurrently the Chairman of ECOWAS and UEMOA. 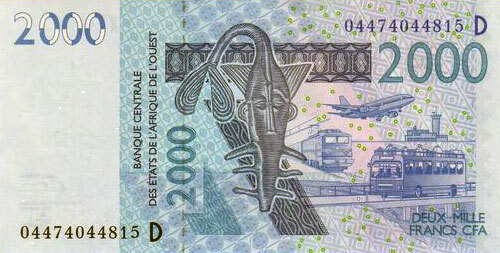 The conflict in Cote d'Ivoire has temporarily affected transport costs as new outlets other than the port of Abidjan have had to be used. Niger has a border dispute with Benin, which was referred to the ICJ in 2002. The ICJ issued a final judgement in July 2005. There is also insecurity along the porous borders with Mali, Libya and Algeria where arms trafficking and smuggling are commonplace. Niger's relations with France, the former colonial power, remain strong. It is the main bilateral donor and trading partner. However, in July 2007, the government accused the French uranium mining company Aviva of supporting the rebels, and expelled their country director. Aviva has also been accused by the rebels of supporting the government side. Negotiations, including a visit by the French Minister for International Cooperation, appear to have repaired relations, but Aviva has had to accept a new deal on Uranium mining which is far more favourable to the Nigerien government than previously. The monopoly over Nigerien uranium once enjoyed by the French, which dates from the development of nuclear power and nuclear weapons in France in the 1950s, is now effectively over. Relations with the USA have strengthened following Niger's participation in the Pan-Sahel partnership (which also involves Chad, Mali and Mauritania). It focuses on military and anti-terrorist training. The country's remote northern region has been known to be used by the Algerian Salafist group. UK's relations with Niger are good but minimal. The key element is humanitarian assistance. The British Minister for International Development, Hilary Benn, visited Niger in late 2004 in the company of his French counterpart. There is no British Council presence in Niger. Trade is very modest. In 2006, the UK imported goods worth £0.2 million while exports of goods were valued at £4.6 million. In April 2004, the UK opened a liaison office in the capital Niamey, for the first time. UK coverage of Niger is the responsibility of the British High Commission in Accra. 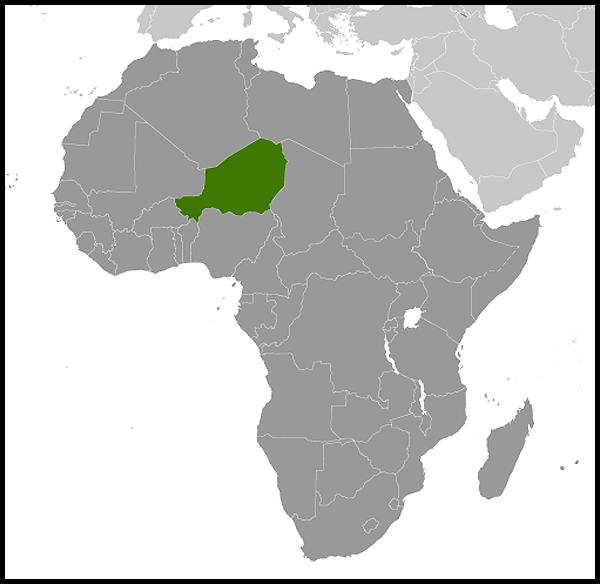 Niger is a landlocked country in the West Africa, straddling the boundary between the Sahara and the Sahel. It is the largest state in West Africa but with a small population of some 12 million. It has borders with seven countries - Nigeria, Chad, Libya, Algeria, Mali, Burkina Faso and Benin. Two–thirds of the country is desert. The Niger River valley in the south-west allows for crop farming and provides seasonal pasture for cattle. Niger is ranked as the third poorest country (167 out of 169) measured in the UNDP Human Development Index. But modest improvements are now being recorded in the health and education sectors. Life expectancy in Niger has risen to 52.5 years, while overall enrolment in education (primary and secondary combined) has increased to 28.7% of the population. There are serious obstacles to sustained development, however, including a hostile desert environment and limited arable land. Recurring drought is a major problem. The UK Department for International Development (DFID) channels money for education in Niger through the French development agency (AfD), contributes to humanitarian assistance following the UN emergency appeal (totalling £5.25m). The UK government, along with other donors, wrote off 100% of Niger’s bilateral debt in January 2006 following Niger’s successful completion of the HIPC process. Under the new constitution, adopted in 1999, (the country's fifth since independence) which re-introduced a multi-party system, Niger has an Executive President, an 83-member (since raised to 113) unicameral National Assembly, both elected for five year terms, and a Cabinet headed by a Prime Minister, who is appointed by the President. The first multi-party elections under the new dispensation were held in October and November 1999. Mamadou Tandja won in the second round of the Presidential elections with nearly 60% of the votes in an election judged by observers to have been free and fair. Subsequently, the first ever municipal elections took place in July 2004. Decentralisation was a key part of the peace agreements of 1995 with the Tuaregs who had been in rebellion for some years. President Tandja was re-elected in December 2004 for a second term with 65% of the vote while his party the Mouvement national pour une Societe de Development (MNSD) won the largest number of seats in the legislature- 47 out of 113. The largest opposition party is the Parti Nigerien pour la Democratie et le Socialisme (PNDS). Other parties such as the Convention Democratique et Sociale (CDS) have taken ministerial appointments, blurring the lines between government and opposition. In October 2006, the Education Minister and the former Education Minister were both arrested following an audit which showed mismanagement of EU funds in the education sector. Partly as a result of these accusations of corruption, the government of Prime Minister Hama Amadou's government lost a no-confidence vote on 31 May. President Tanja replaced him with Seini Oumarou, who had previously been a minister in Amadou’s government. Amadou still commands support in the ruling party, which appears divided following his departure. A new rebel group based in the North of the country has emerged in May 2007, calling itself the Movement of Nigeriens for Justice (MNJ). Its demands include better representation for Tuareg people in the army and in employment in the mining sector. Since the middle of 2007 hostilities have continued. President Tandja seems determined to find a military solution to the problem and has accused the MNJ of using spurious political demands as a cover for banditry and smuggling. There have been numerous clashes between MNJ and government forces in which both government troops and MNJ rebels have died. The numbers of casualties are disputed by both sides, but it appears that several dozen have been injured or killed. On February 18 2010, a military coup was carried out against former-President Tandja in the wake of the high percentage of votes received by Tandja in local and parliamentary elections held in October 2009. The Junta swiftly created the Supreme Council for the Restoration of Democracy (CSRD) with strong support from the general population, with rallies being held in Niamey and across the country. Presidential elections concluded on 12 March 2010, resulting in the election – as expected – of Mahamadou Issoufou as the country’s new leader. EU and AU election monitors judged the elections to have been conducted in a largely free and fair manner. Upon his election, President Issoufou identified that his main priority will be to reduce poverty through sustainable development, in particular the modernisation of Niger’s agriculture and water supply (last year’s humanitarian crisis – with food shortages across the eastern Sahel region following late and uneven rains – provided a clear demonstration of the importance of development work in Niger). Other areas that President Issoufou has identified as critical to Niger’s development, including infrastructure, energy, education and health, will also benefit greatly from the resumption of EDF funding. It is also likely that Issoufou will take a tough stance on AQIM, but Niger has limited capacity to deal with the threat of terrorism and organised crime. Consequently, there are strong expectations of Issoufou to be a strong advocate of regional cooperation on these issues. Since the return to civilian rule in early 2000, the human rights situation has improved. Political freedom now exists, there is an active civil society and an independent press. However, journalists are sometimes arrested for printing articles critical of Ministers, and a newspaper (l’Opinion) was suspended in July 2006 for printing articles critical of the government’s handling of demonstrations over the price of basic foodstuffs. The crisis in the north has had a negative effect on press freedom. The Nigerien correspondent for the French international radio, Radio France internationale, Moussa Kaka, and the local journalist Manzo Diallo were was arrested on 26 September and 9 October 2007 respectively for alleged complicity with the rebellion. Two journalists working for a French TV channel were arrested on 17 December for filming in the area of the rebellion without authorisation. International human rights organisations have accused the security forces of carrying out extra-judicial executions and other human rights abuses in its fight against the MNJ. The MNJ has been accused of laying landmines, which have claimed several victims. Niger has a long tradition of bonded labour, like neighbouring Mali and Chad. Anti-Slavery International has claimed that there are up to 43,000 slaves in Niger. In May 2005, the government introduced a law threatening slave owners with up to 30 years in jail. So far, few people under bonded labour have been released.